Present industrial practice for production of most phosphorus-containing fine chemicals is by the energy-intensive reduction of phosphate to white phosphorus (thermal process) followed by oxidation with environmentally hazardous chlorine to give phosphorus trichloride. 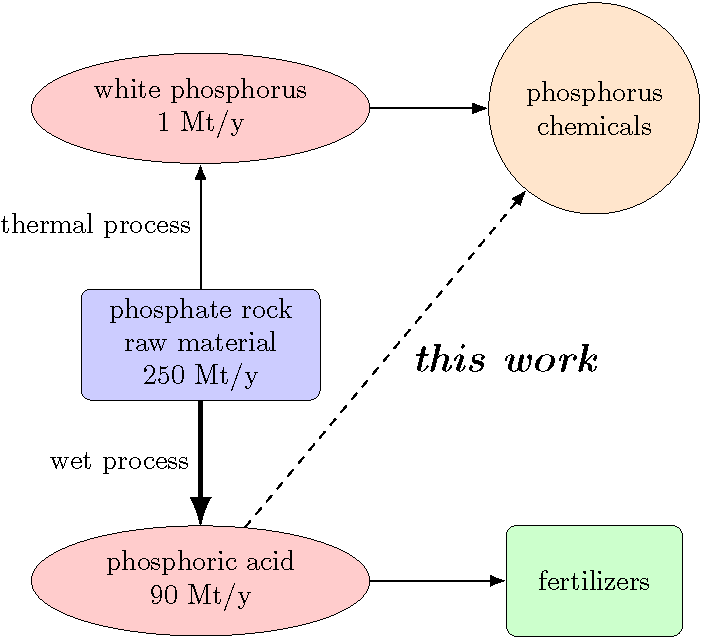 However, production of phosphoric acid greatly surpasses that of white phosphorus, accounting for 95% of phosphate rock mined on an annual basis. A superior approach for the production of phosphorus-containing fine chemicals would therefore be to access them from wet process phosphoric acid in a direct manner, enabling substantial reduction of energy inputs, waste, and potential for harm to the environment. During the first year of this project, we succeeded in discovering a new method for the synthesis of phosphorus-containing fine chemicals, using "wet process" phosphoric acid as the starting point. Using trichlorosilane as an inexpensive, high production volume reducing agent for trimetaphosphate, we created a previously unknown bis(trichlorosilyl)phosphide (BTP) anion isolated as a tetrabutylammonium (TBA) salt. With this new anion, we prepared phosphonates, phosphines and the hexafluorophosphate anion, valuable compounds for the agricultural, fumigation and battery industries, respectively. To the best of our knowledge, this is the first time such value-added phosphorus chemicals have been prepared directly from phosphoric acid. We continue to investigate other methods by which to bypass white phosphorus as an intermediate, making useful phosphorus-containing products directly from phosphoric acid. Sidestepping White Phosphorus, Chemical & Engineering News, v. 96, n. 7, p. 7. Perfecting the Phosphorus Process, The Tech, MIT, March 8, 2018. Alternative Pathway to Phosphorus Compounds Skips White phosphorus, Katrina Kramer, Chemistry World, 9 February 2018. Geeson, M.B. and C. Cummins (2018). Phosphoric acid as a precursor to chemicals traditionally synthesized from white phosphorus, Science 08 Feb 2018: eaar6620, DOI: 10.1126/science.aar6620.